Mmmmmh, now where have I heard of that before. Here's an idea, instead of looking for the next Quantum Leap. 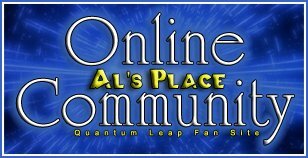 Bring back Quantum Leap! Wow. First there's that pilot about the time traveler correcting mistakes in the past, and now this. Let's see... are there any other aspects of QL that can be ripped off and made into a TV show? Why does the sci-fi channel hate me so?? Is it too much to ask for some originality in television and movies anymore? Wow, this site really is an education! I'm learning stuff I didn't know about all the time. True, this bit of new knowledge falls into the "What the..." category, but still. It's interesting. Got to wonder whose idea this was and how they thought they'd get away with it. Oh, and if they in fact will get away with it.